It looked like Top Chef became Iron Chef when the two finalists, Brooke and Kristen, went head-to-head in a flashy kitchen studio with a live audience. The cheftestants were competing to win the best three courses out of a possible five in order to be crowned Top Chef. For the first course, Kristen served chicken liver mousse while Brooke went with a crispy pig ear and three-minute egg. The judges gave Kristen the win. The second course was a scallop battle and this time Brooke's hard-seared scallop won out over Kristen's citrus cured mollusk. With the score tied, Brooke tried to show that she could cook chicken on the bone with vadouvan chicken wings. Kristen's bone marrow and celery root puree won the round however. Course number four was a red snapper battle. Brooke paired her snapper with pork cheek while Kristen went with a simpler preparation using leeks and uni. Kristen's clean, straight-forward approach gave her the third win and the title of Top Chef. What did you think of last night's finale? Leave your comments below. well, all you had to do was look at the clock to realize there wasn't time for a fifth round, and kristen would take it. i would have preferred they cooked all the courses and then had the judging. i would have really liked to see what they did for desserts. that said, hooray to kristen and also to brooke. both presented elegant food and maintained tremendous dignity. Same here - would loved to have seen their desserts. Terrible format! 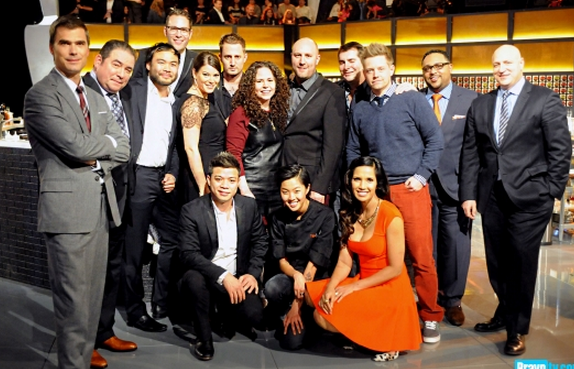 I'd just watch iron chef if I liked that style of competition. Pretty terrible end to a good season. Nothing to do with the chefs, they were fantastic. Well, Minx, since I still can't post on Minxeats b/c of my computer, I enjoyed the recaps as usual. I was rooting for Brooke but was glad it was between the two of them. Very happy to see Kristen win it. I did not like the round by round judging. Prefer the head to head, then judge the whole meal. I think Top Chef is a shell of its former glorious past. The finale format was bad in so many ways. First, you'd think production would have taken the time to set up the format better for the tv audience...like showing us how each chef got her sous chefs or explaining how much time each chef had to put together the menu, etc., or why the chefs had the menu they did. Brooke's menu in particular didn't seem to flow together. Second, with so many chefs working at the same time, there wasn't enough time to focus on food and the actual preparation. Iron Chef does a much better job tying in shots of food prep and the finished plate than this finale. The result was a real distancing of the audience from the actual food. Third, the round by round judging was painful to watch. Would have been much better to judge the meal in its entirety. Lastly, I'm not a fan of Last Chance Kitchen. It just seems wrong to crown someone a champion who didn't have to endure the tasks set up for the regular Top Chef contestants. Some of these are based on endurance or teamwork or carrying out more complicated tasks, none of which are addressed in LCK. Theoretically you could have a winner who only participated in one TC challenge. What a joke that would be. This isn't a slam on Kristen. She seems like a great chef and worthy of the title, except she was eliminated once. I would have preferred or been just as happy seeing Brooke and Sheldon in the finale. Terrible disappointing format for the finale. Absolutely painful to watch and boring. Double what kns said here. Chef Kristen Kish is Top Chef!